The Audio Device Reader block reads audio samples using your computer's audio device. The Audio Device Reader block specifies the driver, the device and its attributes, and the data type and size output from your Audio Device Reader block. The output of the Audio Device Reader block is determined by the block’s parameters. If the block output is a matrix, the columns correspond to independent channels. This port outputs the number of samples overrun while acquiring a frame of data (one output matrix). To enable this port, select the Output number of samples overrun parameter. ASIO drivers do not come pre-installed on Windows machines. To use the ASIO driver option, install an ASIO driver outside of MATLAB®. If Driver is set to ASIO, open the ASIO UI outside of MATLAB to set the sound card buffer size to the value specified by the Samples per frame parameter. See the documentation of your ASIO driver for more information. ASIO and WASAPI drivers do not provide sample rate conversion. For ASIO and WASAPI drivers, set Sample rate (Hz) to a sample rate supported by your audio device. This parameter applies only on Windows machines. Linux machines always use the ALSA driver. Mac machines always use the CoreAudio driver. The device list is populated with devices available on your computer. The possible range of Sample rate (Hz) depends on your audio hardware. The number of input channels is also the number of channels (matrix columns) output by the Audio Device Reader block. To specify which input channels your audio device acquires, on the Advanced tab, select the Use default channel mapping parameter. Samples per frame is also the device buffer size, and the frame size (number of matrix rows) output by the Audio Device Reader block. When you select this parameter, the block uses the default mapping between the sound card’s input channels and the matrix columns output by this block. When you clear this parameter, you specify the mapping in Device input channels. Channel 1 maps to the first column of the output matrix. Channel 2 maps to the second column of the output matrix. Channel 3 maps to the third column of the output matrix. Channel 3 maps to the first column of the output matrix. Channel 1 maps to the second column of the output matrix. Channel 2 maps to the third column of the output matrix. To specify a nondefault mapping, clear the Use default mapping between sound card’s input channels and columns of output of this block parameter. When you select this parameter, an additional output port, O, is added to the block. The O port outputs the number of samples overrun while acquiring a frame of data (one output matrix). 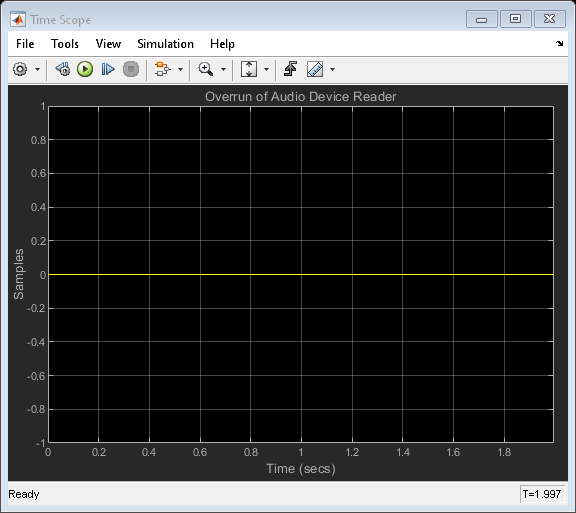 Examine the Audio Device Reader block in a Simulink® model, modify parameters, and explore overrun. [a] Supports 16- and 32-bit signed and 8-bit unsigned integers. The executable generated from this block relies on prebuilt dynamic library files (.dll files) included with MATLAB. Use the packNGo function to package the code generated from this object and all the relevant files in a compressed zip file. Using this zip file, you can relocate, unpack, and rebuild your project in another development environment where MATLAB is not installed. For more details, see Run Audio I/O Features Outside MATLAB and Simulink.